The October Battleborn update is nearly here! 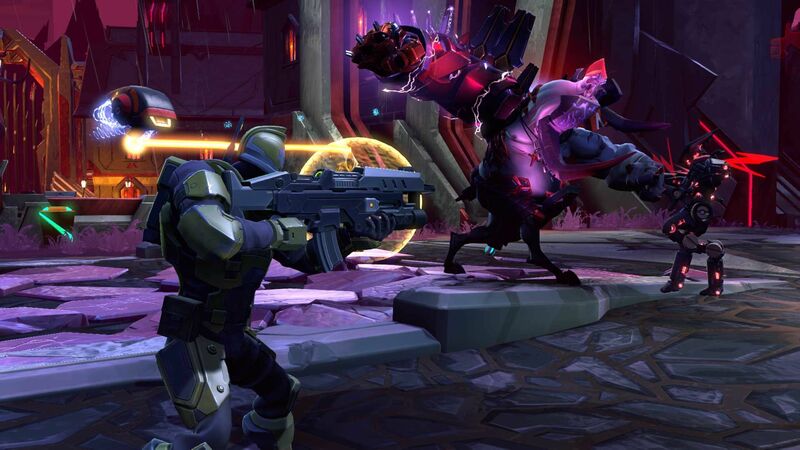 Below you will find the patch notes for Thursday's update and you can find more information on new content, such as the new PVP mode Face-Off and the Story Operation "Attikus and the Thrall Rebellion," on the Battleborn blog. The update begins rolling out on Thursday, October 13, at 2pm PT/ 5pm ET. "Increases the duration of Rage. +25% Duration"
"Increases the effect of Rune Power on Boldurdash. +20% Rune Power Effect"
"Flashbang's cooldown is reduced for each enemy hit. -0.5 Seconds Cooldown per Hit"
"Intensifies the slowing effect of Stealth Strike. +100% Slow"
"At the conclusion of Stealth Strike, Shayne and Aurox's attack speed is increased. +15% Attack Speed for 5 Seconds"
"When Tag Team ends, a portion of the damage dealt is returned to Shayne as health. +35% Damage Returned as Health"
ISIC: Level 2 Right Helix Augment This Might Sting! :O, Level 3 Left Helix Augment Not Dyin' Today! , Level 4 Left Helix Augment Hold It Right There! }:O, Level 6 Left Helix Augment Burlier Wards! :D, Level 6 Right Helix Augment Let's Hug It Out <3, and Level 7 Left Helix Augment Bring It On!